Note: This is picture was constructed by combining 3 smaller pictures into 1 large one. Can you find all/some the main Class 3-4 students in this picture? 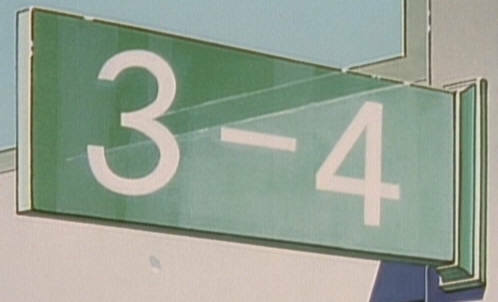 You've reached the home of the previous, infamous, and dangerous 'Class 2-4.' Now that it's a new school year, they've moved up a year (into Grade 10)... but they can be still be dangerous... depending on the situation of course! "Miyabi-ism" is the term I've created to refer to a student who is NOT on Onizuka's side, but rather siding with Miyabi Aizawa to try to get rid of their homeroom teachers. Listed below are the fine students (major and very minor) in this homeroom, and some information (BASIC AND SLIGHT SPOILER!) Please proceed with caution! YOU HAVE BEEN WARNED!!! The information is based on the North American anime and manga versions, so this page will be updated accordingly as they become available (any hints of future events/occurances were done based on advanced research)! I've tried to include the absolute basic facts, plus some interesting ones as much possible. Some of my personal opinions have been included at no extra charge! Section first created on: December 24, 2002. >>Subsequently, I don't own any of the OTHER anime characters mentioned/referenced to/ or shown below. **Note listings below ARE NOT in alphabetical order. Plus the class manifest can change at any time!!! Conversion to "Onizuka-ism": 1st person to convert; Manga>Volume 2-Lesson 13, Anime>Volume 1-Lesson 3 Though he didn't side with Aizawa, Onizuka did help him out when the help was needed the most. Yoshikawa gained a good friend he could always count on and look up to. -Has a little friend group/clique of his own once Yuuki Miyamori comes/returns to Holy Forest Academy in Manga Volume 20. Can be considered the class geek. Despite the fact that the class was 'together' in attempting to oust Onizuka, the class still had their individual differences and conflicts. Bullied around by Anko Uehara, Yoshikawa tried to take the punishment and abuse, but almost couldn't hold on. Onizuka prevented him from comitted suicide twice when it became too much to take. He did though come up enough courage and smarts to save Onizuka from getting fired (also enlisting Kikuchi's help as well required some confidence/courage). This allowed Yoshikawa to get some friends (also to stop being so alone), particularly Kikuchi. He is an anime fan (ex: Evangelion) and a very avid videogame player. 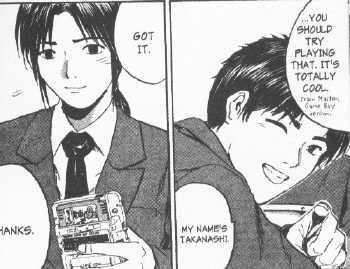 Onizuka had always looked to him for help in games... especially RPGs (ex: Wild ARMs)... well maybe not when it was Yoshikawa gaining wins over Onizuka in a Tekken 3 type game in an arcade. What will the series (anime & manga) hold for this quiet, small, and semi-weak student? Time will tell... perhaps a trip to Okinawa might help things? Although he's on Onizuka's side, he often doesn't get the chance to help out. When the chances do come to help out, Yoshikawa shows his kind, and selfless side when trying to help out. Click here to go back to the 'front' (top) of this room (page). He is in this class... but he's not around at the moment. Go over to the computer lab to learn about him! -'Leader' of one of the 'groups' of the class (Murai, Kusano, and Fujiyoshi). Murai tries his best to help out Onizuka whenever possible... though the stuff done is almost as risky and dangerous as some of the stuff Kikuchi pulls. One such case was during the Togaku Test sequence of events. Kikuchi saved Murai, Kusano, and Fujiyoshi from getting busted-despite Kikuchi's warning. A little hot-headed at times, Murai can rush head on into a situation without understanding everything, sometimes dragging along Fujiyoshi and Kusano along with him. Murai also provides cigarettes, lights, and even money when Onizuka needs it-though he does get annoyed though. Also at times, Murai can double as Onizuka's personal assistant... er slave... running errands for him (more true in the anime). Speaking of love interests... Murai can't seem to figure things out... making that aspect a bit complicated! One of Murai's good friends. Usually just followed Murai around. In the manga, he actually tried doing something to get rid of Onizuka (involving a cockroach... thinking 'bout Fear Factor). Although his role may seem small at the moment, an event in Manga Volume 9 (Anime Volume 7) occurs involving him. This will enable us to see a little more of his character in action. Fujiyoshi comes from a rather large, but poor family (of at least 4 siblings). It can be assumed that paying for Holy's Forest tuition takes up a significant portion of the earned income (his mom works to make buttons if you couldn't tell), not to mention food and apartment rent. Not much is known about Kusano. He's friends with Murai and Fujiyoshi... and again usually just followed and offer help whenever it was needed. He has a fat mother (manga reference only), and it embarassed when his own friends makes fun of that. Has his moments in the late volumes of the manga. 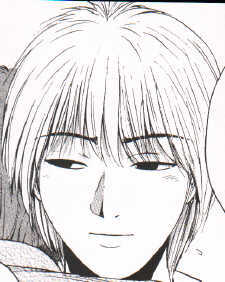 >>Potential Love Interest: Ai Tokiwa (manga only). Tomoko is a really nice person... once you get to know her. It isn't her fault for the way life intended it to be. She ended up with a F cup bra size at age 14, but she's a bit slow. (Note no offense meant at all!) Sometimes it takes her a while to realize just what is going on. Also while a bit clutzy, she tries her best though. Tomoko means well, and probably never intentionally tries ruin things or to make people unhappy. Aizawa used her to try to oust Onizuka, but it backfired because of the wrong locker. In the manga version, the trap was much more dangerous and sexual in nature, while it was a bit more tame (but still somewhat serious) in the anime. Aizawa couldn't put up with Tomoko's slowness despite being friends for a very long time (the anime version revealed this fact . Onizuka helped out... making her a big TV star. In fact, parts of the manga have been done (miniseries style) where we get to see what she does, and some of the adventures that happens. Remember the old rule that 'apperances can be deceiving.' Tomoko really is a sweet and kind girl, despite the intentional/unintentional mess ups. In all due honestly, she and Kikuchi would make a very deadly team. In fact, take the morals away from him, and you'd have a male version of Kanzaki. Although it may seem like Kanzaki has no morals... she does... you just have to look hard to see that she does. Although Kanzaki can be nice too. She's a close friend to one Tomoko Nomura, since elementary school. Really now... what she tries doing for 'Onizuka-ism' can often be a little too extreme. Although the intentions are fine, the means to get there may not be. Regardless, she's definitely a 'commander.' Only one other person is on her level. Note about Kanzaki's secret: In the anime... it was made to the viewers immediately due to the limited length of the series(if you were able to follow the dialogue and pick up on it that is)... while in the manga it will be touched upon in Volumes 16 & 17. If you know French, then you might be able to pick up on it based on Kanzaki's French spoken in Volume 8-Lesson 62. (Anime Volume 4-Lesson 18). The 'clues' provided by Kikuchi can help slightly (manga Volume 8). The last resort is to consult the Cultural Notes that were included with the 4th GTO DVD (US release). Careful if you don't want to know right away... or if you want to find/figure it out for yourself. -'Leader' of one of the 'groups' of the class (Uehara, Asano, and Izumi). Later on-just before the trip to Okinawa, Uehara shows that isn't all that bad of a person-to a certain extent. We get to see some of 'Onizuka's magic' rub off on her at around Lesson 30 (Anime)/Lesson 80 (Manga). Her actions start to lead her away from the 'spoiled mother's daugther' role that she 'held' at the beginning of the series... but is it enough? And like the others, there is a past leading to the present. Friends of Uehara... they assist with whatever she wants done-and that involved bullying up on one Yoshikawa. Of course their actions or assistance wouldn't go 'unrewarded' as well. Asano and Uehara did smoke, over at the karaoke bar. When Uehara jumped over to Onizuka's side, they soon followed-if not gradually. First appearance: Manga>Volume 3-Lesson 17, Anime>Volume 1-Lesson 4. -'Leader' of one of the 'groups' of the class (Aizawa, Shirai, and Iijima) until certain events take place... The other group (Aizawa, Kanzaki, and Nomura) is pretty much defunct-existing when the three were a lot younger. -Is 16 by the time Volume 17 comes around in the manga. -Hair color was black at the start of the anime/manga (and returns that way in the manga given certain events in Volume 23). In the manga, it turned into 'Rei Ayanami' blue in Volume 14-Lesson 110. It turned blonde in Volume 22-Lesson 180. Wow. She really hates teachers and her parents. I think she was content in sitting back and watching Kikuchi (doing his things with the computer) and Kanzaki (for the time that she actually WENT to school) do her dirty work. If you think about it, there has to be SOME reason why she endorses the hating of teachers/started in the first place. In the anime, it's what happened to her best friend that set her off-along with actions from teacher Saito that were supposed to have happened but never did (Volume 10). In the manga, it's what happened involving a teacher (Volume 23) and a student formerly in Class 4 (Volume 23). I mean it's unusual to just do this stuff for the fun of it. I'm sure we'll learn about it soon enough! Although she's evil... it's not at the level of Kikuchi or Kanzaki (maybe even combined?). She was forced to take matter into her own hands to keep the 'pact' going when everyone started to go over to Onizuka's side (the first time was when she used Tomoko). 'Pact' is it? I sometimes thought Aizawa as a virus... spreading out... infecting others... but eventually to die out... Some would say that, but some would say that the concept of friendship and loyalty was there (everyone acting like jerks to the teachers due to the fact that they WERE all that close to each other)... though misdirected and misguided. After the event at the pagaent, Miyabi really started to get pissed off at Onizuka, because of the things he did for Tomoko-which led Aizawa to feel some humilation in front of everyone. After a good portion of the class has 'converted,' (which included 'last chance' Kanzaki), Aizawa was forced to take matters in her own hands again (esp. not after getting 'picked on' by Kanzaki)... and of course she wasn't alone in doing so. Now Miyabi attempts to do things-her own way again. But you must keep in mind that she did most of the observing (for the most part, but there was at least one exception)... and that most of the work was done by the others (i.e. 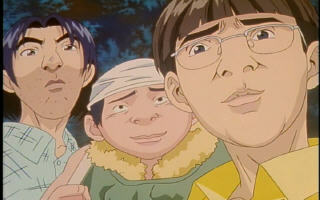 Kikuchi, Kanzaki, Murai). Do you honestly think that she, Shirai, and Iijima are that good to START with (remember that their plan to get Onizuka using Tomoko backfired)? It is said that you get better with experience... generally. Did I mention that her problems aren't just limited to Holy Forest? Aizawa has some issues at home as well... (though never resolved by the end of the anime version). Some hints/information about that can be found with the information about her parents at the cafeteria. Kinda makes you wonder how and when Onizuka finally gets the message to her... The message taught (and the means) is different (for the most part) in three versions of GTO (the anime, manga, and live action drama). >>>>>Aizawa's Conversion to 'Onizuka-ism' in the anime doesn't occur until the very last episode (Lesson 43). Manga-wise, you could probably say that Aizawa 'joined' Onizuka's cause/side in the very last moments of Volume 23, or the opening events of 24. By then, he finally gets through to her. They are the lackees/followers of Aizawa... almost willing to do anything for her. Will that be their downfall? Or maybe they do have the ability to think to themselves... Shirai was the one who entered Miyabi in the pageant, along with herself... doing it was a friend. Shirai didn't make onto the stage for the event, but even if she did... it was doubtful she could have beaten Aizawa (without facing some potental scorn). In Volume 14 of the Manga, Aizawa returns to 'shock and awe' everyone in Class 3-4, and boy did she deliver. Aizawa casts away Shirai and Iijima because of what they did during the Okinawa trip (or in other terms what they WEREN'T suppose to do). Because of this, they can be considered part of Onizuka's group as of Lesson 110... the both of them tied as the 7th person to convert. Despite being castaway from Aizawa, they still do care about her. In Volume 10-Lesson 42 of the Anime, Iijima and Shirai hung out with the Kikuchi and the others (after the Okinawa trip and after Saito was stabbed). There would be no confrontation between them and Aizawa about their 'betrayal.' Even though they don't contribute anything at all to the Onizuka cause at/after this point, they are considered converts (taking Kikuchi's advice)... again tied for 7th. Appearances: Manga>Volume 8-Lesson 68 up to Volume 9-Lesson 69. -Madoka is 'Leader' of one of 'groups' of the class (Madoka, Hikita, and Miko). **Madoka and Miko's last names were never revealed during the time they were in the manga. Kanzaki being accompanied by the cosplaying boys. Cosplay: Turn A Gundam (from "Turn A Gundam") Volume 13 of the manga mistakingly lists it as "Tarn A." If you haven't guessed already, these three students of Class 3-4 love anything and everything Gundam. While there isn't anything wrong with having an interest in an anime series (or Gundam in general), these three just shows how far some crazed/obsessed fans can be. We meet them while the 3rd Year students are at Okinawa. The hotel rooms hold 4 students each. Knowing that... and the fact that the homeroom teachers assign rooms to their students, you could imagine the chaos that might happen if you stuck someone with these three boys. Unfortunately for Onizuka, he poorly chooses the person... and will end up paying for it in cruel and unusual ways... The three Gundam nuts are interested in their fourth roommate-mostly because of her resemble to a blonde character from 'Mobile Suit Gundam' named Sayla Mass. -"Heero": one of the main characters of "Gundam Wing." The full name is 'Heero Yuy.' The series was aired on the Cartoon Network (which led to the showing of Mobile Suit Gundam, Gundam 0080, Gundam 0083, 08th MS Team, G-Gundam, and recently Gundam Seed here in the US due to exposure/increase in popularity of Gundam), and was released here in the US on DVD (10 volumes) by Bandai. Graphic Novels based on Gundam Wing was published by Viz and Tokyopop. -"Federation": organization trying hard to fight and stop the Zeon forces from ruling space/blowing up the Earth in the majority of the Gundam series. -"Beam Rifle": Potent weapon used in the majority of fights through the Gundam series. -"New Type": Humans with psychic/superhuman abilities. It is said (in the Gundam series) that this is the next step of human evolution-that would take place if humans were to migrate to space. Two of the (many) main characters in Mobile Suit Gundam are of this type. -Anime Volume 10-Lesson 41: The dialogue about the 'legs are for decoration' and 'high ranking officers' were derived from 'Mobile Suit Gundam' episode 41. The particular scene in question was between Char and a Zeon soldier about a status of a mobile armor. -Manga Volume 17: The shirt Onizuka wears throughout most of the volume has gundam related stuff written all over it! We met these two students during one of the (many) days that Onizuka decided to not 'teach' the class anything useful/constructive. Onizuka asked the Ouiji Board/'Kokkuri-san' who Kamioka likes. The answer just happened to be someone in the class... a girl named Hitomi. The members of the class whose fingers were on the pointer/coin ('moving it' if you think they did) were Onizuka, Yoshikawa and Kamioka. Some of the subsequent questions and answers didn't go too well with another member of the class. Unfortunately Kamioka and Yoshikawa were on the end of said member's rage (though they probably evaded it in the manga version). These two male students of class 3-4 appeared during the beginning of the 'Okinawa' sequence of events. After losing the money for the trip, Fujiyoshi was confronted (and interrogated) by several members of the class. Katsuyama received a punch from Fujiyoshi (after possibly punching Koji's buttons a little too much), while Shiozaki was the one who informed Onizuka of the situation. **They could have appeared in the manga, but were never given 'names.' [Volume 10, Lesson 78]. Yes she is in Class 3-4... as she is a student who recently transferred to Holy Academy and into Class 4 after the school term started. She learns a lesson from Uchiyamada, and what was said on that day has changed her life forever (and fortunately for the better). One of the few people to visit Uchiyamada after the jetski incident at Okinawa... and the one who helps Uchiyamada realize a few things in life. One of the students of class 3-4 who befriended Yuuki Miyamori upon his return to Holy Forest. Choice of videogaming is rather... interesting. -Student # 42. Yes this means that in the manga, Class 3-4 has (at least) 42 students. That's one BIG class. -Sometimes accompanied by a girl name Ageha. She'll be at the cafeteria if you want to learn about her. If you thought some of the characters were mean... or even dark... you haven't seen anything yet. Not only will Onizuka get involved in helping him, our dear Kikuchi will play a role as well (in more ways than one)-seeing as how he's the only person who seems to know Wakui better than anyone. Got introduced to one Ichiro Okinoshima... the same manager who is helping Tomoko with her career. There is a reason for this by the way... for revenge. -His father happens to be in the Japanese mob/yakuza. His mother passed away 2 years before he would meet up with Onizuka for the first time. -Father put together a baseball tournament for Yuuki because he wanted to play. -'Aligned' with Yoshikawa just after returning to school. -A smoker, like Kikuchi, or the occasional Uehara. >If you look at the picture... Yuuki looks like Yoshikawa... with longer bangs in the front and that ponytail. You don't know what you're missing out on if you don't try it... and you don't know a good thing (or person) until you get to know it (him or her). Ms. Tokiwa learns a few important lessons as she tries to enact her own brand of justice onto the school. But of course it will be Onizuka to teach her a few things as to get over the past. Second picture: Sho without glasses... his true side. -Has some fighting skills (Manga Volume 24) that can really make him dangerous. -We meet Sho while Onizuka was trying to pawn off some of his private videos in order to make some cash. Sho's actions (which ALSO helped prompt the advisory/content warning on the volume 20 cover) prompted Onizuka to act... in order to help him out. The BAD news is that it seemed too easy... too quick. And in the GTO world... it can be said that 'the worst is yet come.' With practially every major student in 3-4 comes a story/past... and Sho is of course NO exception. Like Ai Tokiwa, he too is a member of Daimon's 'Angels.' His 'acting friendly' is all an act, and which is why he's not the 10th person to convert to Onizuka's side (that honor went to Tokiwa). BACK TO THE FRONT OF THE ROOM!! !